Most students go through college scrounging for change or waiting for their refunds to drop. 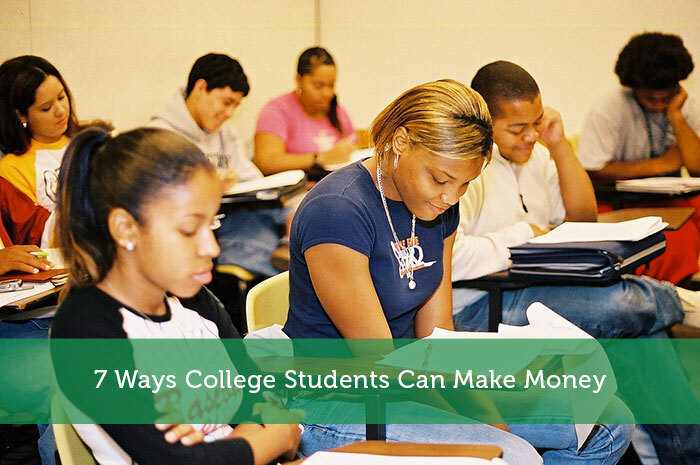 There are many other ways for students to make some cash. Today I will be discussing 7 ways that college students can make money. The first way that a college student can make money is to work a part time job. A student can look several places for a part time job. Restaurants, grocery stores and shopping malls are great places to start. I went to college in Savannah, Georgia. There were numerous restaurants that hired students all during the school year. Students can also check to see if anyone on campus has any part time opportunities. I’m sure if you look hard enough you will be able to find something. The 2nd way that a student can make money is to sell candy or sweets. Sometimes vending machines in dorms just don’t cut it. People love their sweets and are will to pay for them. During my freshman year I made so much money off of this candy called “chews”. Chews are small pieces of taffy that are very addictive. I had people coming to dorm room up until midnight trying to get some. I also was the only person selling them in the city so that definitely helped with sales. Depending on how many people live in your dorm you could make a couple hundred bucks per week. If you excel in a certain subject you may want to look into tutoring students. Tutors can make a decent amount of money depending on the subject and the amount of people they tutor. Students can find other students that need tutoring by advertising their services on social media accounts such as Facebook and Twitter. They can also put posters up around the campus. The 4th way a college student can make money is by babysitting. Depending on the city where there college is located, the need for a sitter may or may not be that great. Promoting your babysitting business to people you personally know with children is a great way to start. Another option is to search Craigslist. You may be able to find potential clients on there. The 5th way that a college student can make money is by completing surveys. You can make a couple hundred dollars a year if you put in the time. The amount that you could make off a survey varies in range. Some pay out a measly $0.10 while others could pay $15-$20. Three websites that I’ve used to complete surveys for cash are Cash Crate, Amazon Mechanical Turk and Swagbucks. With Swagbucks you actually start out earning points. The points can be converted to cash or gift cards. Number 6 on the list is to sell items on eBay. As a college student you may not have that many items to begin with. One item that will definitely make you some money is your old text books. I’m pretty sure you will make more money selling them on eBay than you would selling them back to the school store. Some school book stores might not even buy them back! Other items that you can sell are old shoes, clothes and school memorabilia. If you need help starting out with eBay check out this post I wrote a few weeks ago titled The Beginners Guide to Selling on eBay. The last of the 7 ways for a student to make money is to donate plasma. I had a couple friends donate plasma when we were in college. They did it a few times per month and made over $100. The plasma centers do have certain guidelines that their donors should meet before donating. Check with your plasma center to make sure you qualify. Those are the 7 ways college students can make money. Have you ever tried any of them?